Do you need a portable drawing board, or drafting board table top? With your own tabletop drawing board, you'll be ready for inspiration whenever it strikes. This necessary piece of drawing equipment can work as a portable stand-alone work surface, or can be used with a compatible drafting table base to complete your drafting workstation, for blueprints, art projects, and more. Whether choosing portable or tabletop drawing boards, take a moment to think about the surface on which you will create your masterpiece. 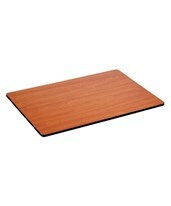 Will you need a smooth, stain-resistant melamine drafting board that cleans up easily? Or do you like the responsive surface of an unfinished wood drawing board? 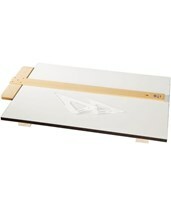 There are a variety of drawing board and drafting board sizes. Colors and finishes to suit your needs. 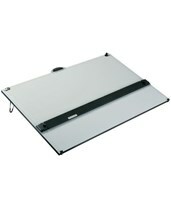 The ultralight tabletop drawing boards make it a cinch to move your portable drawing board from place to place. Some drawing boards come with a built-in parallel straightedge with a locking mechanism to ensure straight, even, parallel lines, while other tabletop drawing boards come with a t-square, handle or non-slip feet. In addition, some drafting table tops come with a carrying case to hold your drafting supplies, or with rubber edging and vinyl board covers for extra protection. Do you like to draw at an angle? 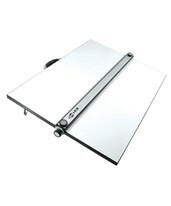 Look for a drawing board with foldable legs to tilt your drawing surface. 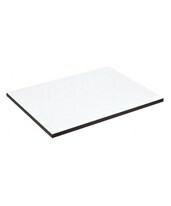 Some drafting boards also feature rubber tracks along the back for a non-slip grip when you pull your tabletop drawing board towards you across the edge of the table, so you work at exactly the right position for you. 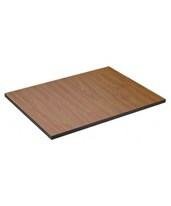 Whatever drawing board table top you choose, Tiger Supplies stocks a full selection at great prices. 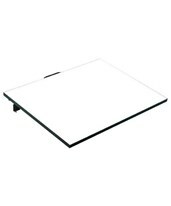 We have a variety of top quality tabletop drawing boards from such well-known manufacturers as Alvin, Mayline, and Safco. You'll be sure to find something to suit your creative needs.